“Universal and basic coverage for all”, “reducing out-of-pocket payment”, “look at ways to help the elderly”. These are some of the buzzwords that the Government has used to sell its Medishield Life Bill. Now let's take a look at the reality. Essentially, what Medishield Life has done is to take a portion of funds from your Medisave to pay for bills of patients who end up with catastrophic or chronic illnesses which require expensive treatments. Many of these patients cannot afford to pay these bills and the hospitals end up having to write these debts off. In 2011, Singaporeans owed $110 million to public hospitals. This presents the PAP with two problems: One, the Government is unable to collect the money because many of these patients genuinely cannot afford to pay the bills and, two, it makes the Government look heartless by making Singaporeans go into debt because of medical expenses. The introduction of Medishield Life will allow the Government to take the Medisave funds from Singaporeans through Medishield Life premiums to pay for these debts. It will top up the shortfall of funds by about $800 million a year. In principle, this is a step in the right direction. It is what the SDP proposes – everyone shares in the stake of the health of our fellow citizens by pooling the risks in a national healthcare insurance scheme. 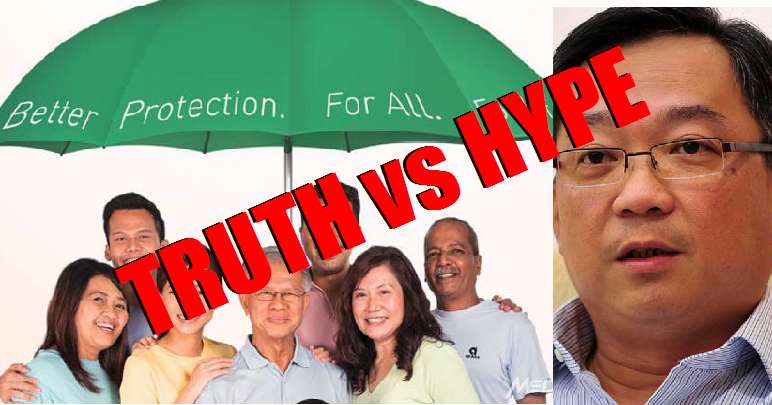 The difference between the SDP's plan and the PAP's Medishield Life – and it's an important one – is that the PAP continues to place the burden of paying for healthcare on the people. While the SDP proposes that Medisave be scrapped and the funds of $43,500 be returned to our CPF, the PAP insists that the Government retains this amount to pay for our healthcare expenses. On top of this, Medisave payments are restricted, making the people pay even more from out of our pockets. Also, the deductibles – the portion of the hospital bill that must be paid out of pocket before Medishield Life will pay the remaining expense – remains unchanged between $2,000-$3,000. Most routine hospitalisations fall into this category. What's more, the Government claims that it subdises medical expenses. The SDP has questioned the Government's prices because subsidy of inflated prices is a gimmick (see here). By doing this, the Government not only makes the people pay more but also inflates its subsidy levels. Such practices has allowed the PAP Government to shirk its responsibility and use public funds to do business all over the world through Temasek Holdings instead of focusing on the people's health. The chart on the right says it all. While governments in most industrialised economies pay about 70% of the country's total healthcare expenditure, our Government pays only 30%. Even with the added $800 million a year, its portion comes up to only 40%. The Government collects this amount in road tax alone. 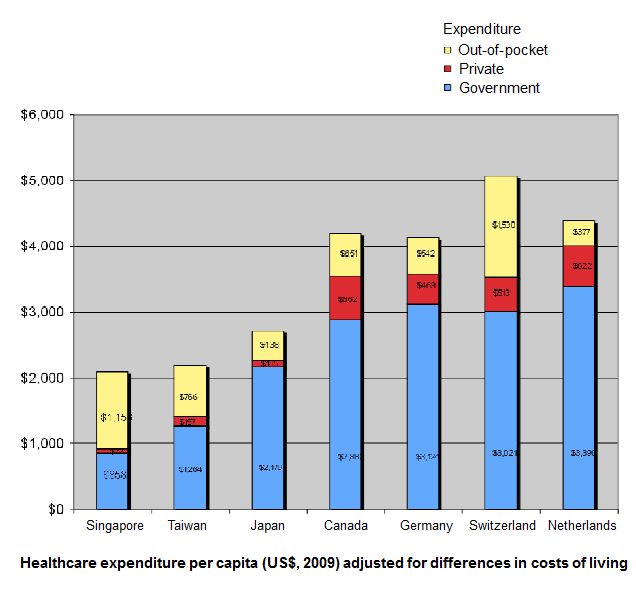 Another point that Singaporeans must remember is that our public healthcare system is still a profit-making one. The PAP euphemistically calls this approach “cost recovery”. This is consistent with its philosophy that nothing in Singapore is free, meaning that this Government considers itself more like a corporate entity than a steward of public interests and monies; it treats the people more like customers rather than citizens. And because it thinks like a business, it will recoup whatever costs it lays out. This can easily be done by raising taxes or levies at some later stage. The end result is that Singaporeans still end up paying the bulk of their healthcare expenses through their Medisave and out-of-pocket payment, leaving little in their CPF savings for retirement. This is not the right thing to do. The SDP's National Healthcare Plan proposes that the Government increases its portion of the country's total healthcare expenditure. This can be paid for through a combination of paring down the Ministry of Defence's budget, levying a tax of luxury goods, abolishing GST for medical expenses, etc. Only when the PAP stops trying to make money from Singaporeans in healthcare can it truly say that the Medishield Life is “universal and inclusive”. Until then, it will just be buzzwords that Singaporeans will see through. For this reason, the SDP would have voted against the Medishield Life Bill in Parliament and tabled our alternative.